While many opt to live together rather than tie the knot, a new study finds that those who choose to say ‘I do’ are making their marriages work and divorcing less than older generations. Census data show U.S. divorce rates fell 18 percent from 2008 to 2016, according to a new study by sociology professor Philip Cohen of the University of Maryland. Age patterns show millennials are driving the trend, even though they are also getting married at older ages and in fewer numbers than their parents and grandparents did. Other factors linked with lower odds of divorce in the study included the number of years married, a higher education level, foreign-born status and white or Hispanic identity. Newlyweds Jerry and Meg Rodriguez of Queens fit the bill for several of those, but they say the main reason their marriage works is because it’s grounded in their Catholic faith. Jerry is the religious education director at B.V.M. Help of Christians, Woodside, and youth minister at St. Joan of Arc, Jackson Heights, while Meg, 32, is a campus minister at St. John’s University, Jamaica, and youth minister at St. Kevin parish, Flushing. 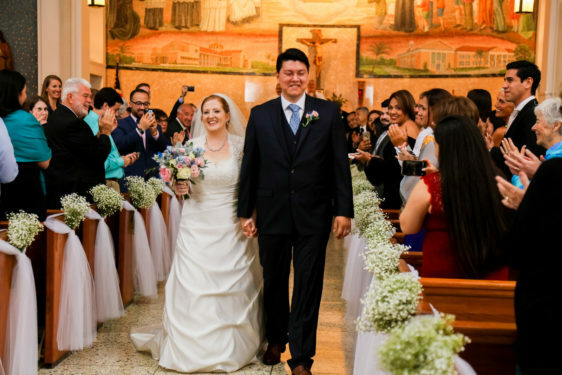 Unlike others in their generation who matured amid parental separation and divorce, they grew up in stable Catholic families – Meg in Rockland, N.Y., and Jerry in El Salvador, and met through their involvement with the Salesians of Don Bosco. They were friends for three years before they started dating. And when they made the decision to take their relationship to another level, they approached it with a clear intention. “We always dated with the vision of marriage,” Jerry said. They invested more than four years in dating to discern whether God was calling them to walk toward marriage or go their separate ways, they said. Spending quality time with married couples – and attending pre-Cana once they became engaged – helped them learn about the sacrament beyond the vows. “Sacramental marriage is more than signing a paper and filing taxes together,” Jerry said. Their extended courtship had a practical aspect as well. Like many of their peers, they delayed their trip down the aisle until they achieved their educational goals. “I knew I wanted him to finish his degree, and I wanted to do my master’s (degree),” said Meg, who graduated with her master’s a week after their wedding. But they also know plenty of unmarried couples who have decided to live together – and perhaps test the waters for something more – rather than make a marital commitment. Jerry said he believes that is because millennials and the generation behind them have almost a safety-net mentality. “They think, ‘I want to have a safety net. If I have to split, I can split at any moment,’” he said, and that prevents people from forming authentic relationships. But at the heart of their marriage vow, Jerry explained, is “a true desire to achieve holiness through our vocation.” He said what motivates him in married life is the desire that he and Meg achieve holiness and heaven one day. “For us, it goes back to God,” Meg added, and remembering that if God willed two people together, He’s going to grace them with all that they need.